By Anna Salimo, South Africa, 20 July 2014. The NICD laboratory in Johannesburg has been performing HIV-1 drug resistance (HIVDR) testing for surveillance purposes using plasma or serum specimens. The World Health Organization (WHO) have adjusted their requirements for accreditation to include HIVDR testing on dried blood spots (DBS) due to their ease of collection, handling, transportation and storage. 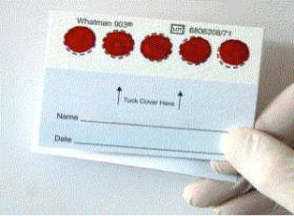 Figure: An example of a DBS specimen (prepared on whatman 903 paper) used in HIVDR testing. To achieve this, validation of the in-house genotyping assay on DBS specimens using WHO guidelines was performed, wherein parameters tested included sensitivity, accuracy, precision and reproducibility. The laboratory has also successfully participated in external quality assessments (EQA) programs. Based on the successful validation of in-house assay on DBS specimens and EQA completion, the NICD laboratory was deemed competent and awarded accreditation by the WHO to perform HIVDR testing on DBS for HIVDR Surveys. The laboratory is the second to achieve such accreditation in South Africa. NICD will offer support and assistance on HIVDR testing on DBS for the Sub-Saharan/SADC region.